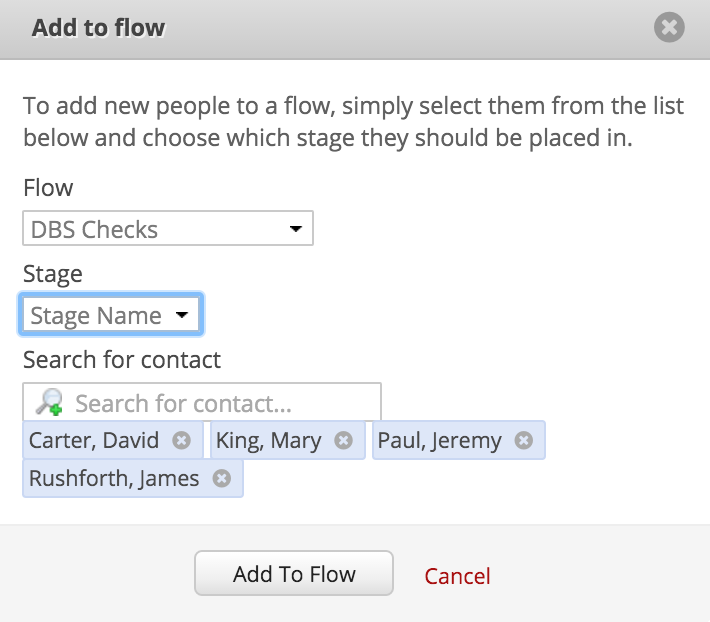 As you may know, Flows are a great way to manage repeating processes that we often take contacts through in churches. For example, the DBS application process, which has lots of stages to complete in order to get a final DSB certificate. Flows make it really easy to manage your contacts at every stage. You can add event sign-ups into a Flow from the Event View page. Go to "Calendar" > "Events" and select the event. Scroll down to the "Event Sign-Ups" section. Select "Add to flow" from the "Add" drop-down menu. A confirmation box will appear, allowing you to select a Flow, and the names of the contacts that are going to be added. By default, contacts are added to first stage of the Flow, but you can optionally override this and select any of the Stages within your selected Flow. Additional contacts can be added too, using the "Search for contact". Click "Add to Flow" to complete the process. You will receive a warning for any contacts that can't be added to a Flow (e.g. if they are already in that Flow). Note: Only active contacts in your Address Book can be added to a Flow. Event sign-ups by people not in your Address Book must first be added to the Address Book (subject to your Data Protection policy). Child signups can't be added to a Flow either. Flows functionality only extends to the adult Address Book. Also, since contacts can only be added to a Flow once, you can safely run "Add to Flow" for a list of sign-ups and only those not already in the flow will be added. Those already in the Flow will be ignored.